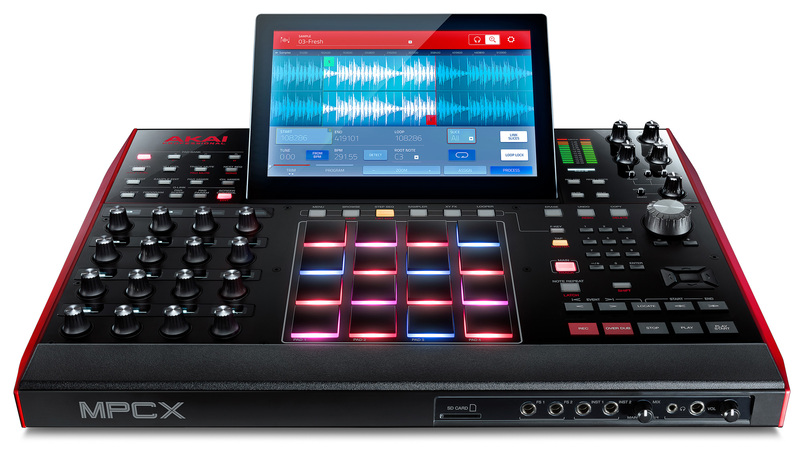 MPC X, Sampling Sequencer from Akai in the MPC series. I see no review has been published for this product so far, so I’ll shoot first. As an introduction, I'll start by stating that I’ve owned almost each and every MPC model ever released, the good ones (60, 3000…) and the not-so-good ones (2000, Renaissance...), plus several other samplers (EMU, 440, SP...). 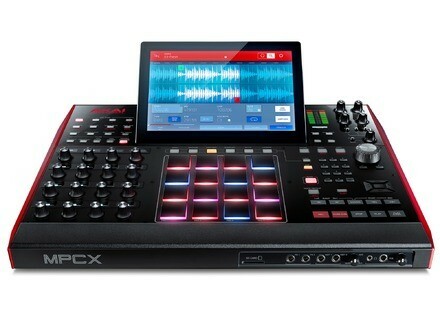 On the hardware side, this MPC X is a very good device. Sturdy, heavy duty, the knobs don’t seem fragile and the building quality is flawless. A little problem with the screen, though: while very practical, it still protrudes above the device when folded, which not only looks strange but also tends to limit its transportability – nothing too bad though. Very efficient LED display on each qlink pot. The main wheel controller is just as you like it, neither too stiff or too soft: the same as on a Ren (and this is one of the Ren’s strengths), and it also reminds me of the 60’s and the 3000’s. The touchscreen does the job. I particularly appreciate the fact that each control has been doubles, through the screen and qlink: in the end, you can choose depending on your own preference. As for the firmware, the software was really well-thought. It features a classical architecture with sequence, track, drum program, MIDI or audio. The various modes are interesting to use and rather intuitive, both in grid edit or step sequencer mode. They have really worked on the ChopChop, and the result is here! The sound edit feature is also totally MPC-worthy. As a whole, the navigation process is rather easy and quick, it will favour creativity and allow you to do everything you can expect from an MPC (granted, it won’t make music in your place!). The overall architecture does the job, I have experienced no bug or freeze so far. However, I haven’t pushed it heavily with 50-track projects overloading the RAM or whatever of the kind. The various controllers I’ve used with it respond perfectly, even if you don’t insist. The MIDI and CV/gate perfectly communicate with other instruments or modules. The USB host is very practical, I have plugged a tiny keyboard on it and it’s instant plug-and-play – a real pleasure. The preamps offer a certain margin, so you can boost your sources if necessary without inducing a hiss. I haven’t used it in controller mode (and I don’t intend to use it as such either), so I won’t review this part of the device. So, that was a first review after using it for 3 days. I may complete it with time if necessary, but so far I believe Akai has really managed to go back to the original standalone MPC concept. I’m unsure as to whether JJ has a lot of margin for software optimization. It’s well-thought and efficient – hats off! !